Unique Design Metal World Map. 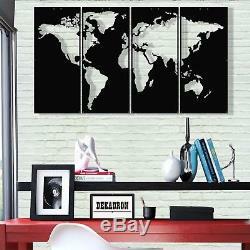 Office Home Wall Decor, Black. 4 pieces, 2 Size Options. Unique Design, Metal World Map Wall Decor. Color: Matt Black, Product Material: 1.5 mm steel, Quality Lightweight 16 Gauge Steel. Product stands 2 cm away from the wall. 40"Wx22"L / 101cm x 56cm 4 separate pieces. 47"Wx26"L / 119cm x 66cm 4 separate pieces. Easy to hang from hidden hanger. You just need a nail for each pieces on the wall. This type of mounting makes the artwork look like it's floating which creates an interesting drop shadow. For indoor or outdoor use. Our products are made of steel/metal, and powder coated to last for years to come. This means that most of my products are shatterproof and UV-resistant! Clean with mild soap and water. Why powder coating instead of other painting methods? Powder Coating is more durable and is safe for the environment. It gives consumers, businesses, and industries one of the most economical, longest lasting, and most color-durable quality finishes available on virtually any type of metal. Powder coated surfaces are more resistant to chipping, scratching, fading, and wearing than other finishes. The item "Metal World Map Wall Art Office Home Living Room Bedroom Decoration 4 Pieces" is in sale since Sunday, March 25, 2018. This item is in the category "Home & Garden\Home Décor\Wall Sculptures". The seller is "tradesoft" and is located in Denizli,. This item can be shipped worldwide.